Since the release of the UAD-1 DSP card in 2001 (in tandem with Mackie at that time), Universal Audio has added plugs on a regular basis, some free, the other not. However, the UA very own policy is to regularly offer price reductions, according to the number of cards and/or plugs already in possession. That allows to buy the new plugs at reduced price. The new OS (4.9.0), if it brings bug fixes and Windows 64-bit compatibility, also comes with two plugs, the Precision Buss Compressor and the SPL Transient Designer. After its successfull partnership with Roland and Neve (and waiting until to see what will be done with Valley People and Empirical Labs), Universal Audio has worked with the german manufacturer to propose the software version of its famous processor, with endorsed and authorized modelling of its Differential Envelope Technology. When the first Transient Designer was released, using the new Differential Envelope Technology designed by Ruben Tilgner, it has been difficult to classify it, as it was the only one of its kind. Which means that it allows to modify the attack and sustain portion of a signal, amplify or smooth them with minimal parameters, no needs to understand the concept behind the machine and in a way that completely differs from usual dynamic processing. Of all-analog design, the original Transient Designer (2-channel version) uses envelope followers (8) and VCAs (2). An envelope follower delivers a control voltage which depends on the level evolution of a signal on a certain amount of time. In the Transient Designer, on a per channel basis, the first of two envelope followers analyses the attack portion of the incoming signal, when the second is linked to the user's settings, made with a one and only Attack button (± 15dB range). Then the Transient Designer calculates the difference between the two informations and delivers the corresponding voltage to the VCA. There's two more envelope followers for the sustain part of the signal, set by a Sustain knob, rtanging from -24dB to +24dB. Sound modifications depend of the analysis and handling of transients, and aren't level-dependent, as are conventional dynamic processors, as a compressor and its Threshold parameter. In Transient Designer, all levels are affected, even the lower, as proportionality is the key. UA has carefully reproduce this typology, adding the graphic appearance of the last version of the unit, specially made for the RackPack, which has a Gain setting and a overload LED. The plug-in is of course designed for the UAD-1, in AU, RTAS and VST versions, for Mac and PC. However, the main point here is to know if the UAD version do the job, which means does it allow to modify transients and sustain portion of an audio signal? Rather than to make long sentences (even if I'll definitely write some...), let's hear what the plug do to various audio files, each of them posing specific issues. Most of the examples includes both raw then edited files. Of course, given settings are only for the selected audeio example, and should not be considered all-purpose values. We've set Attack on +8 dB and Sustain on -7 dB, with a little Gain compensation. The result speaks for itself, and even more when you look at the waveforms: attack transients are clearly increased, while the mic bleed (the sustain) is lowered. As we need a certain amount of latitude to do the mix, we will proceed track by track. Firstly, the kick drum: there's too much common frequencies with the bass, especially as the bass part is an ostinato on the same tonality. The aim is to increase the beater, and to lower the resonance. The setting also allows to drastically lower the bleed, without using a gate. Now to the Overhead, which have lots of bleed, with the guitar on the left and the bass on the right of the image. There's three parts in the audio example, the original, then a subtle SPL treatment, just to slightly shorten ride's resonance in order to leave some place and then an EQing to cut BD/bass/guitar bleed and add some air. Finally, you adjust the respective levels, add a little reverb to glue things together and here is our first drums premix. You'll notice how the mic bleed has been lowered, and the increasing of the attacks, both allowing the drums to easily fit in the full mix, among the bass ostinato, richness of the guitar sound (and there's brass on other sections of the composition). I'd like to say that I would like to have this plug when I mixed this tune a few years ago. Let's see now other sonic situations. Here is a heavily reverberated drumloop, and we'd like this reverb to be removed as much as possible. No problem, you just have to lower the Sustain level (-12 dB) and increase a bit the Attack level (+5 dB). Purely out of curiosity, we've applied once more the same settings to the file. We just have to add a little EQing to enhance the hihat. But the result is stunning, without any unacceptable sonic artifact. Another scenario, a Clavinet whose attack has been lost due to wah and panner treatments. Could we recover a bit of that attack? The answer is: yes. A muted bass, now. The problematic is that we would like to smooth its attack and remove noises, while they are its main constituents... A drastic treatment later (Attack and Sustain to the lowest setting) and the final result is close to the expected one, even if you can hear some of the TD range limitations. Then we'll work on a guitar. Two, actually, as the original rhythm has been doubled. So , when the aim is to cut some resonance and increase attack, how will TD handle the close but distinct transients? Well, that sounds pretty good, isn't it? Could the Transient Designer be helpful when you have to deal with difficult cases? As this voice coming from a bad recording made during an interview: background noise, room resonance, artifacts, etc., a real problem as there's no way to record the voice again. So we start by cleaning as much as possible every unwanted frequency, with the Logic Channel EQ and a de-esser, the Precision De-Esser from... UA, you've guessed right. Then enter the TD with a light volume automation on the two breathing moments. Finally a light EQing and a tiny reverb help to glue the whole thing. It's not perfect, but way better than the original, especially if you add the background music. There again, the audio example includes before and after. There's a debate on the utility of DSP cards, as Mac and PC are consistently getting more and more powerful. As we can't change our computers every six months, DSP cards (FireWire, PCI/PCIe/ExpressCard, etc.) will remain as a good alternative for a good many of us. All the more so as they have another advantage on top of the extra power: most of their plugs are top-notch and often exclusive to the DSP platforms made by UA, TC and SSL, for instance. As regards the "transient modifiers", you have the choice between the hardware original version and some software "not-quite-the-thing-but-close" emulations, some of them of good quality, made by Voxengo (Transmodder), Waves (Transmod), Sonnox (Transmoder), DigitalFishPhones (Dominion, free for PC and MacOS9 only) and SSL (Drumstrip). The partnership with SPL and the endorsement, even if marketing has its importance, has resulted in an excellent plug-in. You can load eight instances per card (in stereo at 44.1kHz). The plug has a list price of $199, the cheaper card $499 (Projeckt Pak), the licence allows you to use it on up to four UAD-1 cards, which means that you can have up to 32 instances in project. The real version (2 channel) has a MSRP of $799, or $459 for the RackPack module version and $1269 for the RackPack Frame. Now, is the plug the exact copy of its hardware model? I can't tell because, as I've said earlier in this article, I wasn't able to borrow a real TD to compare with and having only some distant memories of its behavior. However, it doesn't matter at all: the plug does what it claims to do. Owners of UAD-1 can try by themselves with the 14-day full demo. 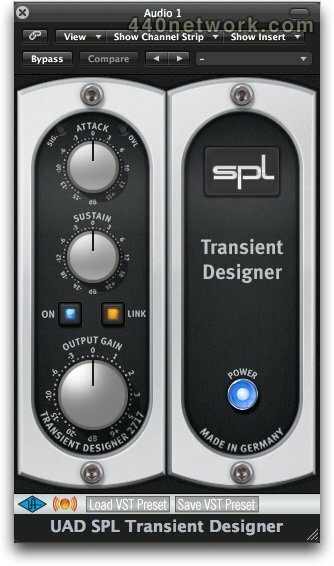 In any case, the UAD SPL Transient Designer is a tool that I would have appreciated to have earlier, as it brings solutions to a huge amount of sonic issues. UAD-1 and UAD SPL Transient Designer are Universal Audio products.